Founded in 1934 to bring together the steel manufacturing activities of Ansaldo - active since 1898 and concentrated in the Campi plant - the company came under control of the I.R.I. in the same year; in 1938 the entire shareholding came under control of Finsider; SIAC began construction of the Cornigliano the following year, which after its destruction in the Second World War would be dedicated to Oscar Sinigaglia. In 1951 SIAC entrusted the reconstruction and enlargement of the Oscar Sinigaglia plant to Cornigliano Società per Costruzione Impianti Industriali (Cornigliano Co. for the Construction of Industrial Plants, founded by Finsider in 1948) which took it over, assuming the name of Cornigliano S.p.A. 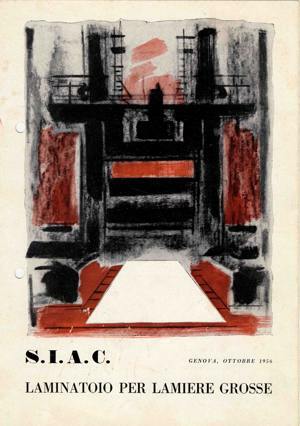 Finally, in 1962 SIAC entrusted management of the Campi plant to Italsider Alti Forni e Acciaierie Riunite Ilva e Cornigliano. In 1967 the company was taken over by Italsider. The archive includes the "Carte Carlini" papers donated by Angela Maria Carlini relating to her sister Alessandra Carlini (1895-1981). After entering the Cornigliano plant in 1925, she then became deputy manager of its laboratory and member of the 1951 joint committee for reconstruction of "treno IV".